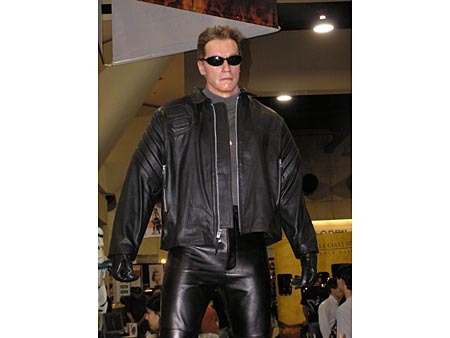 How big was it? 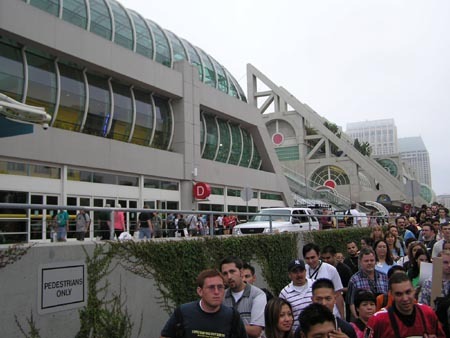 Well, without having a fisheye lens for the camera, all we can show you is about half of the convention center on the bay in downtown San Diego, California. 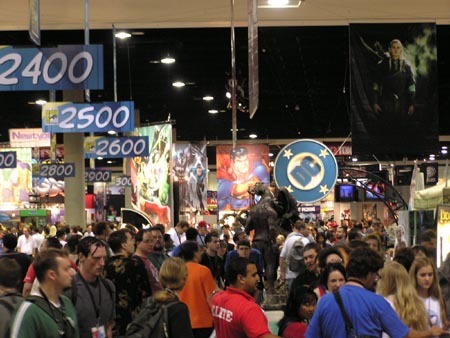 They’re saying attendance this year was around 75,000. We think they’re underestimating. 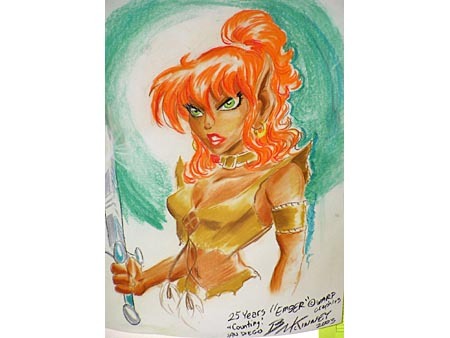 It was into this that Elfquest, at age 25, went. 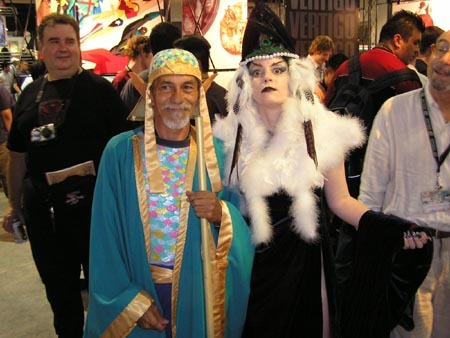 This year, for the first time, Warp Graphics did not bring its own booth – because this year, for the first time, we had someone else “taking care” of both us and Elfquest. 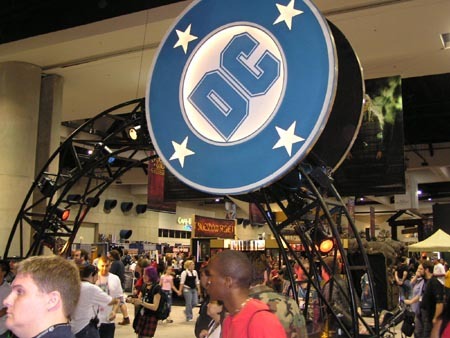 If you’ve read the news from Elfquest.com’s home page, you know that Elfquest has been licensed to DC Comics. 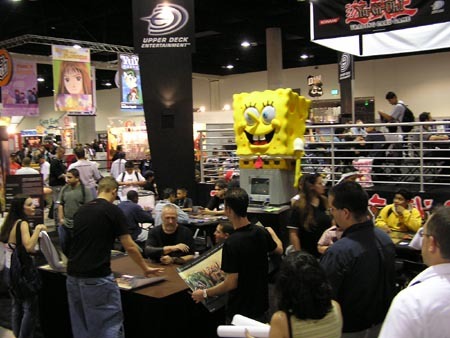 They’re handling all aspects of publishing and marketing… which allows us to concentrate on the creative side. Translation: Look for more new stories in the coming months! We’re not exactly sure why it happened, but we gotta say, it was just like old home week at this show. 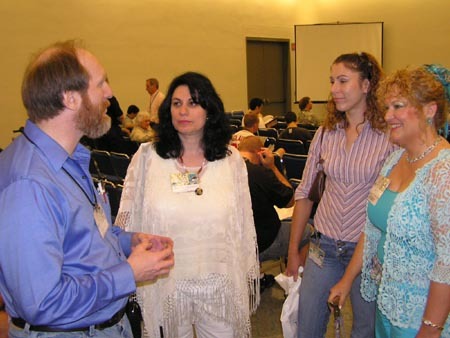 In one place or another, we ran into so many people we’d known or worked with in the past. 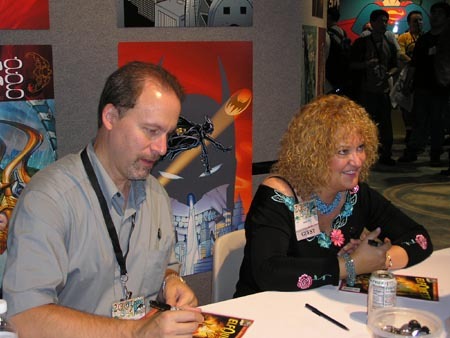 Mike Catron (left) and Joellyn Auklandus both worked for Warp in the 1980s; Joellyn still writes stories for Elfquest. Wendy Rockenbaugh (a.k.a. “Wendy Junior,” standing next to Wendy Pini, a.k.a. 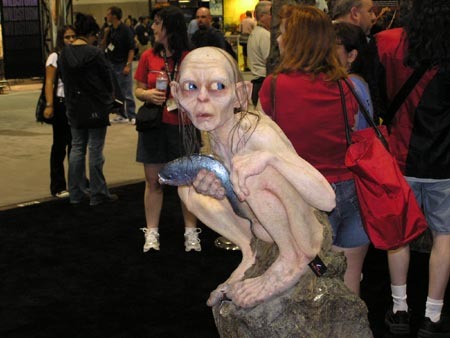 “Elfmom”) has helped us out at several San Diego conventions. 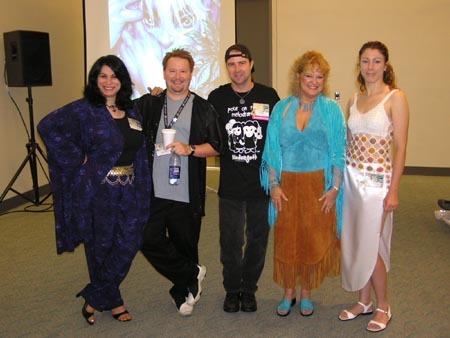 And, on Saturday, at the “25 years of Elfquest” panel, Jeff Zugale (middle, who contributed four chapters’ worth of artwork for “Wolfrider”) was also there. 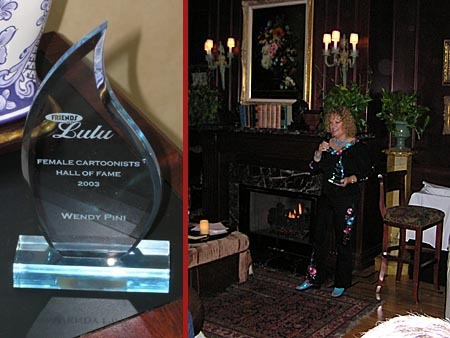 The San Diego show is home to a number of awards ceremonies every year, but one we didn’t expect was the Friends of Lulupresentation Thursday evening, at which Wendy received theFemale Cartoonists Hall of Fame award. Of course everyone in the packed room with a camera wanted to take advantage of the photo op, so we were made to join in the group and endure multiple flash exposures – which we just hated. Not! 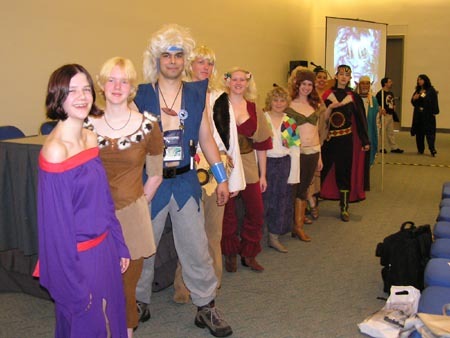 (From left to right, top row: Cat Hunt as Dewshine, ? as Nonna, Andrew Post as Rayek, Richard Pini, Wendy Pini, Elizabeth Rodriguez as Leetah, Joe Tenorio as Sun Toucher. 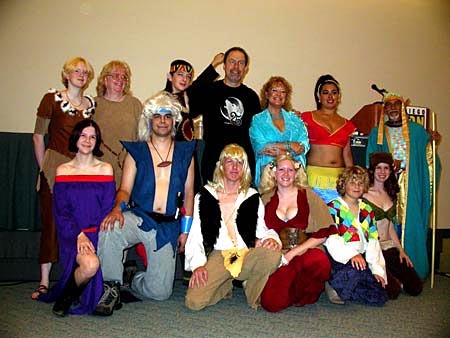 Bottom row: Shannon O’Hara as Moonshade, Chris Rosenbaum as Skywise, Evir Indseth as Cutter, Laura Hunt as Joyleaf, Ian Lane-Lohse as Suntop, Ariana Lane-Lohse as Nightfall)Photo by Seth Grenald. One tradition that we respect regarding the San Diego show, and that we always try to observe, is that many of the visiting artists will donate a drawing to be auctioned off for charity. 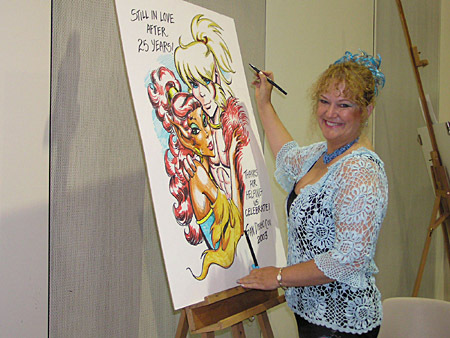 Brandon McKinney, who’s done a lot of artwork for Elfquest over the years, created this lovely image. 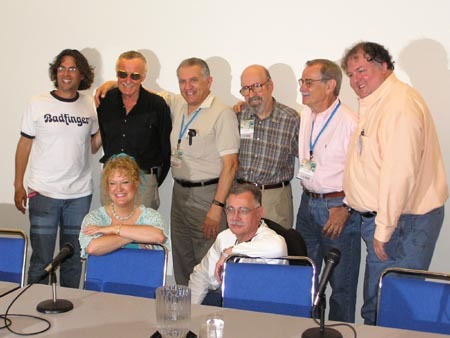 Our heartfelt thanks to everyone who worked on the convention committee to make our appearance an enjoyable one, to everyone at the DC Comics booth who made the many autograph sessions go smooth as silk, and most of all to every fan of Elfquest, whether you were at the show or not, for a quarter century of memories. Here’s to the next twenty-five!